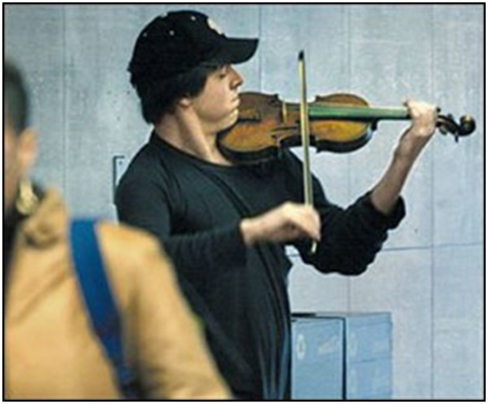 “In the morning of January 12, 2007, a young man in jeans, a longsleeved T-shirt, and baseball cap walked into a Washington subway station and pulled out a violin. He laid out his violin case in front of him, seeded it with a few dollars and some change, and then played six classical pieces for the next 43 minutes, as over a thousand people walked by. This was no ordinary street performer. He was Joshua Bell, one of the world’s great violinists, and he was playing his $3.5 million dollar violin, handcrafted in 1713 by Antonio Stradivari. A few nights before, Bell performed at Boston’s Symphony Hall. Now he stood in front of commuters, playing for coins. This was an experiment by Gene Weingarten, a reporter for the Washington Post. It was intended as an ‘unblinking assessment of public taste’: how would people respond to great art in a mundane context, when nobody was telling them how great it was? Framing is something I’ve been giving serious consideration: Does a painting look better with expensive custom framing, as opposed to a cheap bargain-bin special? Undoubtedly – and that’s a problem for the artist. 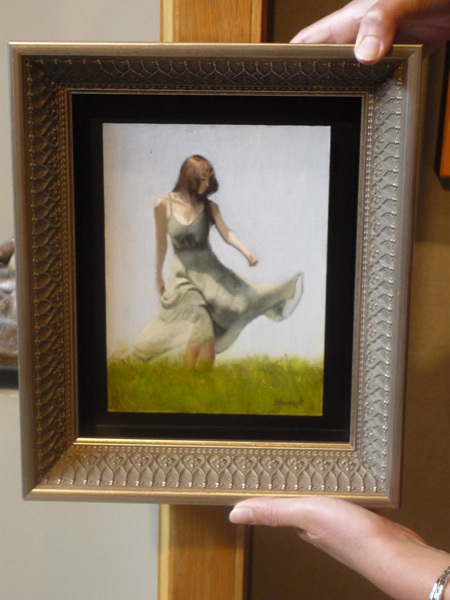 Custom framing pushes the overall price of the piece higher, while the artist’s profit remains the same. It’s a delicate balance between the piece being presented in the best possible manner, versus a higher price unlikely to attract a buyer. Basic economics perhaps, but finding that balance can mean the difference between a painting ending up it’s days in the artist’s dusty basement versus being enjoyed on a collector’s wall. Lately I’ve tried a few experiments of my own. Last spring I took a nice painting and gave it a custom frame. The painting was good, but the framing made it extra special. The framing also doubled the normal price for a painting of that size. Would it sell? It did. I tried again, taking a matched set of paintings with matching frames. I was curious to see if they would sell not only at a higher price, but also as a set. They did. This brings me to the “Rituals” show at West End Gallery. 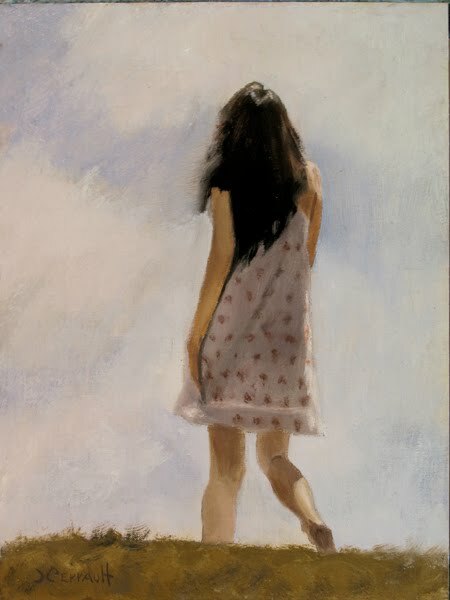 My framer had suggested ‘floating’ a series of paintings together. When I asked him how much this would cost he raised his eyebrows. Of course it’s his job to sell me framing, but I also know he wants me to be pleased with the presentation of my work. With the results of my recent experiments in mind I decided to give it a try, knowing full well the expensive framing would raise the overall cost of the pieces. I was pleased with the result. There is a bit more to the Joshua Bell story. “At the very end of the performance, Stacy Furukawa passed by. She had been at one of Bell’s concerts a few weeks before, and stopped 10 feet away from the musician, grinning and confused. When he was finished, she introduced herself and handed over $20. Weingarten did not count this as part of the total – ‘it was tainted by recognition.’ Furukawa’s gift was because of the man, not (or not entirely) because of the music.